Be Afraid of Driving on Old Tires! Never mind ghosts, witches and zombies, do you know what is really frightening? Driving on old tires! It is critical to your safety on the road that you are able to recognize the signs of worn out, dangerous tread. Even if old tires look okay, they could be seriously compromised and pose a serious a safe driving hazard. Old tires may not show any obvious signs of deterioration. While they may appear to be safe, usable tires, cracks can develop both on the inside and the outside of the tire. Since the rubber compounds used in tires degrade over time, cracks will develop in the rubber, regardless of mileage and wear. Ultimately, this cracking leads to the steel belts in the tread separating from the rest of the tire. The Rubber Manufacturers Association reports that putting an expiration date on a tire can be difficult since factors such as heat, driving, and storage conditions can greatly impact the usable life of a tire. The recommendation of the National Highway Traffic Safety Administration (NHTSA) is to refer to the guidelines set by the specific tire manufacturer when it comes to tire aging and usable life. Not unsure how old your tires are? In 2000 the U.S. Department of Transportation began requiring tires to have a DOT code. With this code, you can learn details about the tire, including its age. Decipher the code by downloading a free app offered by the Tire Safety Group. Available for Android and iPhone, the app enables you to get to get a free Tire Facts Report by simply entering the DOT code from your tire. The report lets you know if a tire is old, defective, or has been the subject of a recall. The app shows you where to find the code on the tire and even includes a flashlight function to help you see the code clearly! If your tires are damaged, old, worn or otherwise compromised, don’t risk the scare of a blowout or a wreck! Buy some new tires as soon as possible! Basic auto service and repairs can go a long way in improving the safety and dependability of a vehicle. The non-profit Car Care Council recommends 10 Fall Car Care maintenance procedures that will help your vehicle operate at its best before the winter season arrives. Fall Car Care Month is the perfect time to give your car the much needed attention before cooler and harsher weather sets in. Just like the Car Care Council, we suggest that now is the time to take care of your vehicle to avoid potential headaches in the future. Check all fluids – Window washer solvent, anti-freeze/coolant as well as engine oil, power steering, brake & transmission. Check the battery – Replace if necessary. Ensure the connection is tight, clean, and free of corrosion. Check hoses & belts – Make sure they are not loose, cracked, brittle, or even showing signs of excessive wear. Check your brakes – Annual brake checks are suggested. As well as taking a look at the rotors, drums & brake linings. Inspect the exhaust system – Leaks, damage & broken elements can occur. Inspect for unusual behaviors or loud noises. Check your engine – Your vehicle craves the best balance of power & fuel economy while producing the lowest level of emissions. Check your wipers – It’s important to see and be seen during winter driving. Check all the interior and exterior lighting. Check heating/HVAC system – Proper heating & cooling performance is crucial for your safety. Inspect steering & suspension – Annual checking is recommended. We would also encourage a review of other components like shock absorbers, struts, ball joints & tie rod ends. Check your tires – Uneven wear and tears can greatly affect your safety. As can poorly inflated tires. Vehicle manufacturers have specific recommendations, so be sure to refer to your owner’s manual tire rotation guidelines if you have specific questions. Fall is here and soon the temperatures will be getting colder. Since low temperatures lead to sluggish batteries, your chances of experiencing a dead car battery will be increased. As the colder months approach, you will not only want to be equipped with a quality set of jumper cables in your car, you will also need to know how to use them safely. Jump starting a vehicle isn’t difficult, but because jumper cables transmit electrical current from one car to another, it can be dangerous if not done correctly. 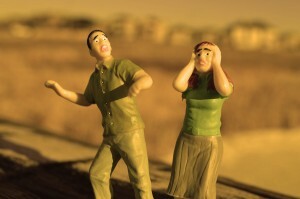 It is necessary to take precautions to prevent dangerous electric shocks. 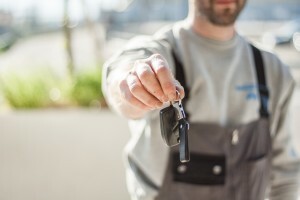 Once you have purchased your jumper cables and have them stowed in your vehicle, take some time to review these steps so you will be prepared to use them! Park the running car so the cars face each other, about one to two feet apart. Make sure that the cars are not in contact with each other. Set the parking brakes on both cars. Turn off both cars and take out the keys. Lay out the jumper cables on the ground, making sure the clamps do not touch each other. Open the hood to both cars. Locate the batteries and battery terminals. (See your owner’s manual for details). The two terminals on each battery are usually covered in red or black, with a + or – sign on top. Confirm you are able to identify which is positive, and which is negative, as this will be crucial to the success of your jump. Dirty or corroded battery terminals should be cleaned off with a rag or wire brush. 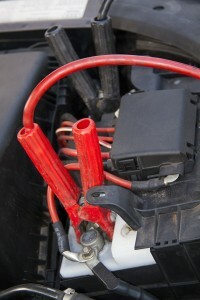 Once you have one end of the jumper cables connected to a car, it is critical that the other end of the cables do not touch the metal clamps to anything other than the specified components on the other car. Make sure that none of the cables are in contact with moving engine parts before starting the engine. Let the car to run for several minutes. The time required to get the jump to work may vary depending on the age and condition of the battery. Attempt to start the car with the dead battery. If unsuccessful, allow the working car to charge the battery for a several minutes longer and try again. As soon as the disabled car is running again, you can disconnect the jumper cables, starting with the black, negative cable clamps. Never allow the clamps to come in contact with each other while any part of the cables is still attached to a vehicle. Taking the charged car for a short drive lets the battery to build up a charge to ensure the battery doesn’t die again once you turn off the car. Tires are a significant investment. Not just because of the high price, but because of how crucial they are to your safety as well as the safety of your passengers. When buying new tires, it is important to get the right tires for your particular vehicle, make sure they are quality tires, and to have them installed by an experienced and reputable tire dealer. Proper tire care is will go a long way toward making sure your tires stay safe and keep them performing at their best. Keeping your tires well maintained is also the best way to extend tire life and optimize the value you get from your tire investment. Make sure that your tires are properly inflated. When tires are allowed to drop to an inflation level that is below the recommended pressure, an additional load is placed on the shoulder of the tire, causing that area to wear prematurely. Underinflated tires also build up internal heat, increasing rolling resistance and reducing fuel economy. It is not always easy to determine if tires are properly inflated just by looking at them. It is important to use a tire gauge to check tire pressure regularly. Keep tires inflated to the level recommended in your owner’s manual. Keep an eye on your tread. This is something drivers don’t often think to do unless they have a noticeable leak or have been driving on unavoidable debris. Checking your tire tread regularly provides you with the opportunity catch wear trends before they have done too much damage. Problems can be spotted by visual inspection or by running your hand over the tread and feeling for problems. Potential issues include distortion in the tread, feathering or cupping. If caught early enough, bad wear patterns can be countered to extend the tire service life. Have your wheel alignment checked regularly, according to the recommendation of your owners’ manual. 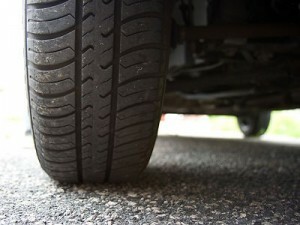 A very common cause of unusual tread wear is poor vehicle alignment. When tires are unable to run straight ahead, accelerated tread wear occurs on certain parts of the tire. Regular alignment service will keep your vehicle from experiencing a variety of alignment related problems, including uneven and premature tread wear. Along with regular alignment service, tire rotation should be performed on an ongoing basis. A consistent and documented schedule of tire rotation will promote even tread wear and extend tire service life. Wheel and suspension components can also adversely impact tire service life. A wheel bearing that has been incorrectly torqued can cause irregular tire wear. Worn shock absorbers can create depression wear on treads. Rather than waiting until trouble strikes, replace shock absorbers and other suspension components on a set schedule. Even if you don’t have students in your home, back to school time effects everyone when it comes to driving. Now is the time of year when the school buses and backpacked pedestrians begin appearing everywhere and we all need to think about back to school safe driving. While we all can relate to the frustration of being “stuck” behind a school bus, it is important for everyone’s safety that we exercise patience and also know school bus traffic laws. It is equally important that we pay attention for students in school zones who may be excited or distracted as they make their way to and from school. 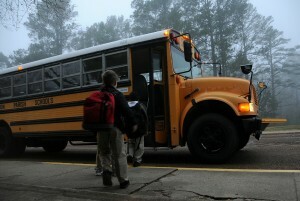 The National Safety Council reports that school buses are one of the safest forms of transportation for students. They caution, however, that more children are hurt or killed outside of the bus when they fail to watch where they are going, or when a motorist does not pay attention and illegally passes a stopped school bus. In all 50 states it is illegal to pass a school bus that has stopped to pick up or drop off children. In all 50 states traffic in both directions is required to stop on undivided roadways when students are being picked up and dropped off. State laws vary on divided roadway requirements, however in all cases, vehicles driving behind the bus, and moving in the same direction must stop when the bus does. Flashing yellow lights on a school bus indicate the bus driver is preparing to stop to load or unload passengers. Red flashing lights and an extended stop sign arm signals that the bus has stopped and children are exiting or entering the bus. A required distance of 10 feet around a school bus must be observed to allow sufficient space for children getting on or off the bus. Be on the lookout for children who may run or fail to observe safety rules when moving to and from the bus stop. Drivers should never block crosswalks when waiting to turn or stopped for a red light. In school zones be alert for warning flashers, and while you are in an active zone, be sure to yield the right-of-way to students crossing in the marked crosswalk. If you know your morning route includes an area with school bus stops, come up with ways to help you safely share the road. Listen to music or a podcast to help you exercise patience with frequent stops. Leave a little early so you won’t have to stress about delays. Remember, the most important thing is that EVERYONE arrives at their destination safely! At some point, every vehicle owner needs to think about buying new tires. Depending on the number of miles you put on your vehicle annually, that time may come sooner rather than later. 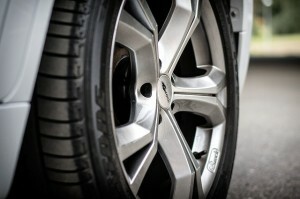 According to Edmunds, if you drive your car around 12,000 to 15,000, your tires should last about three to four years. Other factors that will influence how soon you need tires including the type of driving you do, roads you travel, and whether or not you’ve kept up with maintenance services like tire balancing and wheel alignment. If you are thinking about buying new tires, here are five questions for you to consider to help in the decision process and to aid in protecting your investment. How does your tread look? Tread wear is one of the most critical factors in determining whether or not you need new tires. Most tires have built-in tread wear indicators, but the penny test is another simple way to gauge your tread depth. Hold a penny so you can read “In God We Trust” across the top. Insert it into five different sections of the tire and look at Lincoln’s head. If you can see the top of Lincoln’s head, your treads are excessively worn, and it is time for a new set of tires. If Abe’s head is covered to about the forehead hairline, the tread is in good shape and you probably do not need new tires. Have you looked for promotions? If you have determined your tires should be replaced, you will need to start shopping. Tires are expensive, so begin by looking for promotions to see where you can save money. There are plenty of nationwide rebates and promotions each month that are available through your local tire professionals. Take some time to browse online for not only the right tires, but the best value. Tires are identified with an alphanumeric tire code that might not make a lot of sense to the untrained eyed. Actually that code that gives you a host of information about its characteristics, including the size. For example, P195/70R15 43H M+S, shows you the type, width, aspect ratio, diameter, tire speed rating, and indicates the tire is an all-season tire. By checking out the tire code on your current tires, you will have some basic information about what you will be looking for when buying new tires. Which type of tire is best for your driving? The climate you live in, your driving habits, and your own personal preference can all factor in when determining the tire type that will be best for you. Generally speaking, an all-season tire is a good choice for most climates and vehicles. The all-season tire can be changed out for a winter tire if you live in a northern climate that gets a great deal of ice and snow. How do I maintain my new tires? Regular tire maintenance is the key to protecting your tire investment. Once your new tires have been installed you will want to keep them inflated to the proper pressure to prolong their service and prevent tire failure. PSI should normally be 30-35, but always refer to the specific recommendations for your particular tire and vehicle. Tire rotations, wheel alignments, and tire balancing should be part of your regularly scheduled maintenance to extend the life of your tires and your vehicle. Drivers know that winter weather and dropping temperatures mean that your vehicle will require additional care to assure it runs smoothly and dependably. 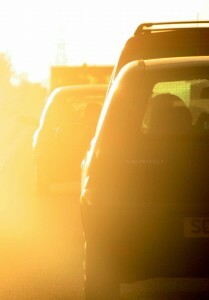 What many drivers may not realize is that scorching summer temperatures can also take a serious toll on your car. To avoid the risk of being stranded, motorists should keep in mind that extreme heat means that vehicles need some extra attention. According to a recent heat wave recap from AAA Mid-Atlantic, more than 9,000 stranded Philadelphia drivers had to be serviced within a seven day period. 40 percent of those calls for assistance were due to dead car batteries and flat tires that resulted from the heat. 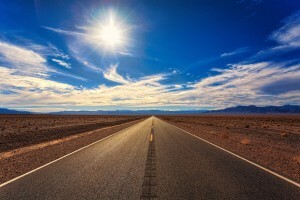 In addition the dangers and inconvenience of being stranded, drivers need to be mindful of the detrimental effects extreme heat can have on the vehicle itself. Driving with an overheated engine can compromise engine components and cause serious damage requiring expensive repairs. Batteries – Heat ruins batteries. Have your battery tested to be sure it is strong enough to endure the punishing summer temperatures. Tires – Soft, under-inflated tires generate heat, which can result in a blowout. Keep your tires inflated to the pressure recommended for your vehicle. Fluids – Check all fluids including the coolant level in the overflow tank and top off as needed. The fluid level in the radiator should be checked as well, however, NEVER remove the radiator cap when the engine is HOT, as this can result in serious injury. Always perform your vehicle’s preventive fluid checks while the engine is cool. Coolant – Drivers should have the cooling system flushed and new coolant installed when recommended by the vehicle manufacturer as part of scheduled maintenance. Depending on the type of coolant used, this is usually required every two to five years. Your car’s engine works hard to convert fuel into mechanical energy, and in the process creates a substantial amount of heat. To manage that heat, your vehicle has its own cooling system that assures your engine stays cool enough to function properly. Engine overheating is a dangerous situation that can quickly put you and your passengers in peril, and put your car at risk for expensive damage. When the engine exceeds 230 degrees Fahrenheit, is overheated, and at temperatures above 245 degrees Fahrenheit, engine damage may result. As the heat increases, the different rates of thermal expansion cause metal to distort. Coolant – Anti-freeze and coolant are critical to your car’s heating and cooling system. Having the coolant flushes performed per your owner’s manual recommendation is extremely important in assuring your engine runs clean and cool. Radiator – Have your radiator inspected to be sure it is in good condition, and that the radiator core has not been damaged by salt corrosion. Another issue to watch for is a plugged radiator core. This problem can happen when coolant flushes are not performed. Cooling Fans – A cooling fan failure can lead to engine overheating problems. In some cases, trouble with the air conditioning system can be a sign that you have a cooling fan problem. Cooling fans should be regularly inspected to avoid engine problems. Thermostat – There is no set mileage that predicts when it will fail, but when it does, it’s important to replace it as soon as possible. A bad thermostat is a common cause of engine overheating. A failing thermostat can also be indicated by the check engine light illuminating or the car heater not working. Water Pump – A compromised water pump will often cause a coolant leak, so if you notice the coolant level dropping at a faster rate, you should have it checked as soon as possible. An experienced auto technician will be able to spot a water pump that is about to fail. Belts and Hoses – The belts and hoses in your cooling system should be inspected to make sure they are tight and in good condition. Cracks or deterioration of the rubber are signs of trouble. 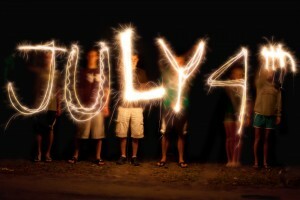 Whatever your plans are, have a fun and safe 4th of July Holiday! Testing has begun in California on a new tech innovation that could completely change vehicle registration in the future – digital license plates. While they will initially be an optional accessory that vehicle owners purchase from dealers, if testing goes well, they could eventually replace those familiar government issued metal plates. The new digital plates, developed by a company called Reviver Auto, utilizes a technology similar to that used by the Amazon for its Kindle E-reader. According to the Sacramento Bee, Sacramento is first city to test the new digital license plates on 24 of the city’s fleet vehicles. The units will have the capability to display public service announcements, amber alerts, and other similar types of information. The California DMV plans to offer the new plates through dealers in conjunction with Reviver Auto. Vehicle owners who opt for the digital plate will be able to register their vehicles electronically, eliminating the need to put updated sticker tags on their plates each year. The digital plates offer particular advantages for fleet managers, who can collect real-time information from fleet vehicles including on-road tracking. The digital plates can be configured to display personal messages or even mini-billboard advertising, which displays only when the vehicle comes to a stop. A security advantage that digital license plates offer fleet owners and drivers is that in the event of theft, the plate can tell both the owner and law enforcement the location of the vehicle. The digital plates are engineered with tamper-resistant and anti-theft features. According to a report in the San Francisco Chronicle, the digital plates will first be sold at dealerships in California and Arizona. Next, they will be available in Nevada, Maryland and Pennsylvania before going overseas to be tested in Dubai. For private consumers who want the technology the price is steep. They cost $699 for individual consumers, plus installation, along with a monthly fee of about $7.